Children are also chanting "Welcome Kanye West" as he hands out pairs of his footwear to them. He updated his latest activity while on his visit to Uganda via Twitter. 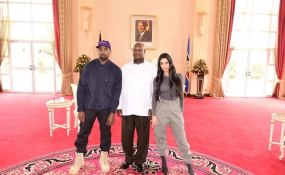 Kanye West, now known as Ye and Kanyesigye (if you like) is currently on a visit to Uganda with his family to record his music video set to be released in November. He recently gifted his famous Yeezy sneaker to the Ugandan president. He has also said that he has plans for tourism promoting plans for the country. He says he wants to turn Uganda into a Jurassic Park.